If you’ve got a classroom full of kiddies, you don’t have to buy them all their own computer or tablet, or crowd around a single device. 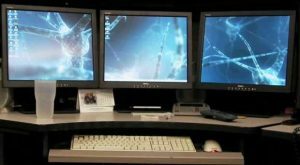 A $25 program called “Multiple Monitors” does the trick. It can mirror the screen from one computer on any other monitors in the room. The program is from ActualTools.com and is easier and cheaper than using HDMI splitters to connect several monitors to one computer. It works in all versions of Windows, from XP on up. Businesses could use it too. We can think of situations where you might want the same slideshow or program running in the lobby and other areas or at a trade show. There’s a free 30-day trial.